1 of 1 Whisk together mustard, vinegar, Italian seasoning, salt and pepper in small bowl. Slowly drizzle in the olive oil, whisking until blended and thick. Cover and set aside. 1 of 2 Place lettuce in bottom and up sides of large salad bowl. 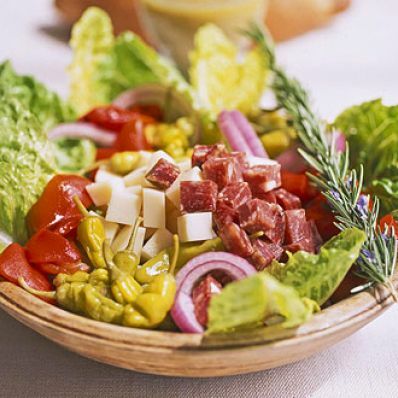 Arrange salami, cheese, peppers, pimiento and onion rings over top. 2 of 2 Serve dressing on side or drizzle over salad.